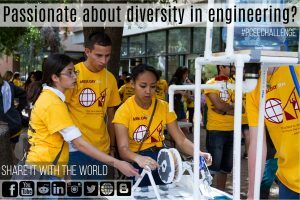 Share with the world how you engage diverse students in inclusive engineering, and compete to win a $1000 travel award to the 2018 American Society for Engineering Education Annual Conference in Salt Lake City, Utah, June 24 – June 27, 2018. (Please share this opportunity widely! )The American Society for Engineering Education celebrates and promotes diversity and inclusion in engineering, and aims to expand access to every student. The Pre-college Engineering Education Division seeks to highlight examples of inclusive engineering through an exciting, creative, and rewarding social media. Follow along using #PCEEChallenge. Beware! You might earn some bragging rights and tons of likes/shares, though you will most definitely increase awareness of the importance of inclusive engineering, and that’s what most rewarding!